At the heart of the office floor plan is a designed level for efficient productivity. How will this space, filled with a range of employees and goals, yield the most lucrative and reliable results? While the cubicle has dominated the office landscape since the 1960’s, recent modifications have exchanged the confinement of a cubicle for an open and collaborative workspace. The stereotypical office setting is littered with cubicles that constrict creativity and cut off coworkers from fully engaging with one another. An open floor plan operates a bit like a canvas. This canvas leads to more uninhibited brainstorming and collaboration by employees of different departments, as well as the flexibility to move around their ideas. Quite literally, some companies design everything in their space to promote employee engagement and collaboration. 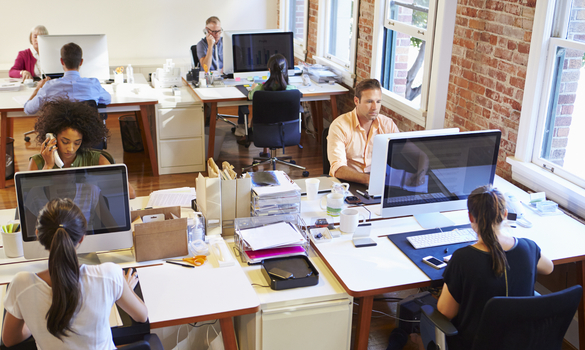 The lack of cubicles helps maximize the use of space and ensures more people can work together. An open floor plan mimics an open air mentality that fosters the sharing of space and ideas. No longer constricted by barriers, coworkers have greater freedom to engage with one another personally and creatively. A greater network leads to an ease of productivity and innovation, as ideas are free to bounce off one another. The promotion of teamwork is another great asset of an open floor plan that leads to more diverse solutions, well organized work and brainstorming sessions. Ideally, there are also less distractions as there is a socialized layer of peer-monitoring. If one was working home alone or alone in a cubicle, one has themselves to report to for an extra coffee break or scroll through social media; with an open office plan and the human eye draw to movement, peer awareness helps foster an air of accountability and productivity. An open office floor plan means little, however, if the company involved does not fully support collaboration. Not every project, every goal, every individual is always suited for intensive collaboration. While open floor plans lend themselves to easier collaboration and movement, there should also be spaces for privacy, for greater silence, and less distractions. Floor plans should provide multiple solitary spaces and allow employees to move about freely, from their shared desk to small study rooms. There should also be dedicated meeting rooms for fixed group projects and conferences that distance themselves from the main office. However, the formalities of these rooms can intimidate people away from using them or lead to someone usurping the space totally for themselves. Instead of designated rooms, there should also be some sort of sectioned-off alcove, an open space sequestered away. As the collaborative workspace comes into practical application, however, numerous studies have shown that noise distraction is a rising concern affecting the happiness, productivity, and stress of employees. In an open setting, noise fluctuations between casual conversations, people moving, phone calls, the taping of fingers against keys and pens against desks cause people to lose focus and have less meaningful interactions with one another for fear of being overheard. Headphones are a quick solution for temporary work, but that also hinders open socialization that collaborative spaces emphasize. The invasion of speech privacy was the leading complaint among offices. Sound-dampening tools such as background soundtracks and sound-proof wall modifications should be considered in designing collaborative workspaces. The office is about interaction; while the cubicle severed coworkers from one another in tiny boxes, the collaborative workspace can be too much of an open free-for-all for someone seeking a realm of more concertation and privacy. The pendulum of collaboration and solitude changes based on projects, time, and individual mentality. No collaborative workspace can be the same and what works for one office may not be beneficial for another company. A balance between individuality and teamwork, openness and walls needs to be struck within floor plans.